This document and its contents are Copyright © 1986-2019 by FKE and The L5 Development Group. All rights reserved. This Web page, and/or the document it embodies, may not be reproduced, copied, or stored, in part or in whole, in any form or manner (printed, electronic, xerographic, optical, or through use of any other technology), other than for immediate viewing via its original URI on L5DGbeta.com, without the express written permission of the publisher. In this chapter, we will first examine the rationale for selecting the current objectives for this space program. Then, a more detailed examination of each of the phases of the space program will be presented. Finally, a discussion of FKE's future plans is presented, indicating the directions the company will move once its initial efforts have been achieved. Although most astronauts and cosmonauts would hesitate to think of it as such, conventional access to space is provided by sitting on top of a bomb and hoping it won't go off the wrong way. Many early attempts to reach into space ended in explosion and fire as the launch vehicles destroyed themselves through mechanical or design failures on the pad or early in their flight. Even today, there are an unacceptably high number of satellites that are lost when the rocket that is supposed to carry them into orbit fails to operate properly and either has to be destroyed on command from the ground, or just blows up in the air. The major design flaw of every space program currently being operated on Earth is that rocket engines are the only means used to lift the vehicle from the ground. Only by blasting away with boosters more powerful than the gravity holding them down can vertically launched rockets get to space. This is directly a tremendous waste of fuel. It also dramatically increases the amount of fuel that must be carried by the vehicle to get to orbit, increasing the potential repercussions of a catastrophic failure. Rockets leave the ground straight into the air, as though they are going directly to space that way, but then arc over to a horizontal flight path once they have cleared most of the atmosphere. A much better launch system would leave the ground in a more nearly horizontal direction, taking off like an airplane. Using aerodynamic lift to gain altitude, rather than the brute force of direct rocket power, will reduce the launch vehicle's weight, increase its efficiency, and greatly improve the prospect of a safe launch. These logical ideas were part of the driving force behind the United States' now-defunct National Aerospace Plane (NASP) program. The NASP project was also working only toward a single stage to orbit (SSTO) objective, a design that would ultimately limit its payload capacity. The SSTO concept cannot be achieved with technology we have available today, resulting in a multi-billion dollar research and development program that could not have been expected to produce a working prototype before the end of the century, at the earliest. In the end, however, it was not technological limitations that killed the NASP project, but political ones: The effort was cancelled in budget-cutting maneuvers, in large part because it didn't have the established support in Congress enjoyed by the already-entrenched Space Shuttle program. Much like many of today's rocket launches, the FKE Space Program will use a three-stage mission profile to achieve Earth orbit. However, that is nearly all that is in common: Our first stage is a massive electrically powered catapult, and the second stage is an airplane, similar to the NASP design, but utilizing more readily available technology. Only in the third stage will rocket power be used, to provide forward velocity, rather than directly fighting the Earth's gravity. Because most of the work of the launch will have been accomplished by the time the rockets are fired, small, easily controlled rocket motors will be used. The entire program is built on science and technology already available, or easily developed as a derivative of existing work. The FKE Space launch profile calls for the launch vehicle to leave the ground two to four miles above sea level and traveling several hundred miles per hour. Taking off at that altitude eliminates the need for the vehicle to fight is way through the lowest, and densest, part of the atmosphere, yielding a significant savings in the weight of fuel that needs to be carried. The launch speed has been chosen to provide enough velocity to allow the ramjets which power the second stage to fire immediately, without using additional turbojet engines. This will greatly reduce the complexity of the launch vehicle, reducing system costs and increasing reliability. The primary reason for using a catapult system as the first stage booster is the most powerful (and heaviest) component of the transportation system never leaves the ground. This will provide a tremendous reduction of the effort needed to achieve orbit: Since the first stage booster never takes off, no fuel is needed to lift it, immediately reducing operating costs. The final boost from the first stage will come as the catapult carriage supporting the spacecraft approaches the end of its track. There, a lever system will "throw" the vessel into the air, imparting the momentum of the carriage to the spacecraft, utilizing the maximum amount of ground-based energy available. Such a design will also alleviate the need for a braking mechanism on the carriage. Once the catapult has launched the vessel from the ground, a hypersonic second stage will perform the next part of the flight. During this segment, most of the orbital speed will be gained, and the launch vehicle will fly to a height above the majority of the atmosphere. Ramjets, with their high efficiency and extreme simplicity (no moving parts), will provide the thrust to carry the spacecraft to an altitude of at least thirty miles, and a velocity of over 12,000 miles per hour. The second stage transport will only need to carry its fuel supply as it leaves the ground, even though its final altitude will be beyond the capabilities of today's aircraft: During ascent, as fuel is consumed, air will be liquefied and stored on-board, making possible operation of the aircraft even when the external atmospheric oxygen has fallen below the level required to maintain combustion. When the second stage mechanism completes its mission, the launch vehicle will be operating in the edge of space. With practically no atmosphere to work against, the hypersonic transport's wings will be unable to provide enough lift to justify carrying their weight any higher. With its control surfaces (rudder, ailerons, etc.) useless for directional control, the aircraft has served its purpose, and separates from the spacecraft to return to the ground, landing on an airport runway like any other jet. Conventional rockets will be used to impart the final five thousand miles per hour of velocity needed to place the spacecraft into its low-Earth orbit. Since most of the work of fighting the Earth's gravity and atmosphere will have already been done, only a small rocket will be needed to place the same size payloads into orbit that are now being boosted by large ones. By the same token, by using a large second-stage aircraft as a booster, it will also be possible to use the same size rockets as are used today, and to carry a much larger payload to orbit. A mix of these two options, as well as development of "mid-sized" rockets, is anticipated within the course of the FKE Space Program effort described in this book. Because we will be using a radically different launch technology when compared with any of the other space programs now operating, none of the existing launch facilities will be suitable for our efforts. As a result, a spaceport will need to be constructed. The development, tentatively called Technopolis, will be composed of two parts: the final assembly complex for the launch vehicles, and a "tail" stretching along the launch catapult to support its operation. Although it will be started primarily as a high-tech spaceport business operation, Technopolis will undoubtedly grow rapidly into a thriving, sizable city on its own, a strong asset to the financial health of the surrounding region. Choosing where to build Technopolis is one of the first major challenges that will have to be overcome before the FKE Space Program gets into full swing. Establishing it at the base of one of the tallest mountains on the planet, the original concept considered, would greatly reduce the materials needed and design challenges required to build the first stage catapult. However, providing access to a spaceport buried deep in a mountain chain could be a difficult proposition, at best. An alternative plan under consideration, which is currently the preferred design, calls for developing the launch catapult as a free-standing structure, using techniques similar to those found in suspension bridge construction. Building the facility on more nearly flat land would make access to the spaceport much simpler, which could actually reduce construction costs below that of a mountain-based facility. In addition, choosing a free-standing design makes site selection a wide open issue, allowing the final decision to be based on other important factors, such as availability of a skilled workforce, and access to industrial capacity or other transportation systems. We originally considered building Technopolis somewhere in the Himalayas, north of the Indian subcontinent. There the highest mountains on Earth are found, with many peaks reaching more than four miles above sea level. Since initially proposing the plan, a number of other concerns have been brought up which led us to reconsider the idea. Among other things, our pilots would be forced to deal with complex wind currents near the mountain peaks, which would make flying difficult, to say the least. In addition, an entire road system would have to be built to provide access to the interior of the mountain chain before construction could begin on the launch facility. Also, there's the problem that no flat land is available anywhere in the area to build runways which would be used for return flights. A "reverse catapult" system could be constructed, wherein an incoming flight would land on a carriage speeding down a ramp, braking as it nears the bottom, but that would probably be at least as difficult a flying challenge as landing on a carrier. It would also leave little room for error, and would require all incoming flights to carry fuel for at least one go-around for safety. Another mountainous location that has been considered is Chile. Since their higher mountains aren't as deeply buried in the range, the area would feature relatively easy access during construction and operation of the launch facility. However, the region is quite prone to earthquakes. A large tremor could easily destroy the launch system, and, if it struck while a spacecraft was being boosted from the ground, it could be disastrous on a potentially global scale. In addition, there are some serious questions about the political stability of the country and its neighbors, so that South American sites are not strong contenders at this time. Conventional wisdom in the aerospace industry would leave New Hampshire as one of the last choices for the site of a spaceport: It's a long ways from the equator, and winter storms leave the state blanketed with snow for several months during the year. However, there are a number of things which make New Hampshire a serious contender for the site of Technopolis: A facility constructed on the Atlantic coast could launch vehicles in a southeasterly direction, out over the ocean. The orbital track would go three quarters of the way around the world before passing over major population centers, leaving plenty of time to achieve a stable orbit without endangering people below. A high-latitude site such as New Hampshire would also be beneficial for launches that are leading to a polar orbit: There would be less of a rotational velocity vector to overcome. Since there are several electric generating facilities in the region, access to electric power for the first-stage catapult would be less of a problem than some of the other sites under consideration. The area is already well established as a high-tech corner of the country, with a skilled workforce readily available, and several of the world's most respected learning institutions located in nearby metropolitan Boston. Other sites within the continental United States under consideration are locations in the deserts of the Southwest, and in the Rocky Mountains: Colorado, Nevada and Utah all have potentially attractive locations that could be developed into a spaceport following our design. Each of these places has its own set of unique advantages, and a set of problems, the most common of which include access to power, labor, and materials, including water. Australia is also being considered as a prime choice for the location of Technopolis. The continent features large areas of undeveloped land near the equator that could potentially be developed for the base. However, since nuclear power is banned from the country, getting enough electric power to run the launch system could be a problem. There may also be difficulties with displacing aborigines in the region, and other obstacles we are not yet aware of. Since it is a relatively attractive site, though, investigation of the possibility of locating our facility there is continuing. There are a couple of locations in Africa that are also under examination. Putting our launch system in the desert would do something useful with the Sahara, but would also require solving some large problems, like getting water, and keeping sand out of the equipment. Since Mt. Kenya is very nearly on the equator, it is also an attractive possibility. Problems with African locations include the fact that the entire continent is plagued with a rampant infection of the AIDS virus, an epidemic in which we would prefer not to participate. Also, nearly every country in the area suffers from political problems that could easily make life difficult in a very short time, with little or no warning. No matter where it is finally sited, the spaceport's location will determine the orbital configuration of flights launched from the facility. A high-latitude launch site, such as New Hampshire, would have significant advantages for launching to polar orbits, especially if the objective is a track whose plane does not rotate relative to the stellar background. However, its semipolar launch trajectory would have considerably higher operating costs for achieving equatorial orbits than liftoffs from locations at lower latitudes. The differential could be reduced by using the attraction of the Moon to achieve gravitationally-assisted equatorial transitions. Studies of the orbital mechanics for such flights, which would have been prohibitively expensive just a few years ago, have been simplified by the development of modern computing systems: Calculating the flight dynamics of complex launches can be done on a desktop system while the countdown is in progress, which will ultimately reduce operating costs by using the best information as it becomes available for each operation. Selection of the first launch site to be built for the FKE Space Program is a complex problem, but it is primarily an economic issue. Unfortunately, the ultimate decision may also be weighted more heavily by the political considerations which such a massive project will lead to than we would like it to. The final choice must be chosen to meet two objectives: low cost (both of construction and of operation), and rapid development of the facility. Balancing all of the factors to achieve an acceptable compromise will be good practice for the challenges that follow the selection. The design base for the FKE Space Program has been built using our existing scientific knowledge: There are no basic principles that violate the physical laws we know today. As a result, the remainder of the project consists solely technological development and engineering work. Nearly all of the technology proposed for use in the program already exists, or can easily be projected from existing designs. The majority of the effort, therefore, will be selecting the appropriate technologies of the choices available, and the mass of engineering work needed to incorporate those technologies into a usable launch system. One decision yet to be made is the final selection of the shape of the launch catapult: whether to use an open top launch rail or closed tube configuration. The open design, currently the preferred choice, provides much more flexibility in vehicle configuration and size. A closed design, however, would allow evacuating the launch tube ahead of the vehicle as it is being boosted toward space to reduce air resistance. Using a closed tube would also reduce weather concerns at launch time, and would make it possible to have acceleration coils located around the entire circumference of the spacecraft, providing a more distributed launch load. Another issue still open in the basic spacecraft design is choosing between an external carriage or integral catapult mechanism within the second-stage vehicle. Using an external carriage design, as described in the paragraphs about the launch profile above, would mean that the lift coils used to suspend the vehicle above its track can stay on the ground when the second stage lifts off, reducing vehicle weight and fuel consumption. An integral carriage, though, yields a design with fewer components, lowering design costs and system complexity, and with a potentially higher reliability. As a result, the savings from reduced maintenance could possibly offset the higher fuel costs. Assuming we can get the necessary clearances from the US Department of Defense, we will be able to purchase the SCRAMjet engines we need from the Marquardt company: They have had operational engines since the mid-1960's but were blocked from offering them for sale because of potential national security problems. Our understanding is their development work has continued, and the engines for our second-stage aircraft could be purchased nearly "off the shelf." We are also looking at aerospike engines, primarily for use on the third (rocket) stage of our launch system. Similar engines are being developed for the X-33 single-stage-to-orbit (SSTO) project, and are said to offer potential efficiencies beyond that of other rocket nozzle designs. However, the technology is still new enough that many questions remain, which could limit our interest in the concept: We want to go to space, not become involved in a long, drawn out technology development exercise. The development of composites, exotic alloys, and other lightweight, high-strength construction materials is being closely watched, since reducing vehicle weight is an important consideration in spacecraft design. Rather than waiting for new (expensive) super-light substances to become available at ill-defined times in the future, we are proceeding to design with the best materials we can get now: Our objectives are to build a space program as quickly and inexpensively as possible. If that means we have to replace parts (or even whole vehicles) in the future to maintain a competitive edge, we will do so - and keep flying and making real progress until those parts become available. Design of the first-stage catapult also has a number of open issues. One question about the power system for the system is how to utilize stored energy to reduce the electrical demand at launch time. A possibility is to pump water into elevated lakes during the countdown, then release it to drive turbine-powered generators and supplement the power from the commercial grid. Other problems to be examined include methods of manufacturing the superconducting coils that will be used for magnetic levitation of the catapult carriage and for its propulsion, and what their interaction with the Earth's magnetic field will be like. Building a magnetohydrodynamic carriage motor to supply its thrust has been suggested. While it is an option, the technological development required to complete a design is well beyond our current plans. It will probably not used in the initial design, but may be an avenue for growth if the design can be demonstrated to provide sufficient savings to warrant the effort. In the interest of avoiding unnecessarily reinventing things, we will use as much technology from the public domain as we feel is applicable to our project, including NASA's work on the Shuttle and NASP development efforts. However, the FKE Space Program will not be limited to using existing technology when obviously better choices are available: As a commercial effort, our decisions are primarily driven by economic factors, not political ones. The FKE Space Program calls for a considerable amount of construction at very high altitudes. While our experience with work so far up in the atmosphere is rather limited, there are problems we already know about and can start planning around: For instance, workers will have to carry their own oxygen supply to be able to breathe properly. Since wind speeds aloft are often much more than they are at ground level, wind chill factors will always have to be taken into account. Providing protection for the work crews from the environment will be a big issue before we even leave the ground. The effort, however, will give us valuable practice for space operations, where the working environment will be even less friendly. Because elevator rides to and from the actual construction could take quite a while, how long it takes to get to the work site will be a consideration as well. Hence the construction teams may prefer to stay at "camps in the sky", near their jobs, for days or weeks at a time: It wouldn't be any worse than staying on an oil rig. The science behind the FKE Space Program is quite clear, and much of the technology is on hand. There are still things to work out, but none of the technical problems are insurmountable obstacles. After choosing the site to build our launch facility, we will be able to proceed smoothly toward establishment of launch operations on a regular basis, and the effort can move into its next phase. With establishment of an economical launch capability complete, the next stage of development will be to construct a hotel and refueling/transfer station in low Earth orbit (LEO). Unlike current NASA plans for a Spartan, minimalist research station, our strategy is to construct a large and comfortable facility, capable of hosting a diverse mix of uses ranging from pure scientific research work to honeymoons in space. The hotel, as important as it seems to the people who stay there, will in actual fact be a side effect of the development work, since the primary objective of the LEO facility will be to provide a work site for construction and refueling of Lunar transfer vehicles. Our space station design calls for construction of counter-rotating rings to provide artificial gravity in the living quarters while minimizing the need for torque thrusters to stabilize the position of its stationary hub. Besides being the structural core, the hub is where transitory spacecraft dock, and the location of the antennas used for communication with the Earth and other bases. Until solar power satellites are in place and can beam energy in from above, the space station will have to have its own means of generating electricity. One possibility under consideration is wiring the station itself as a generator and providing power directly through interaction with the Earth's magnetic field. This would probably result in a constant demand for fuel to maintain the station's orbit, but may prove to be economically sound. An equally radical alternative is using power from arrays of solar cells or nuclear engines, then using electric coils interacting with the magnetic field to provide thrust to maintain the orbit. Both possibilities are interesting ideas, but more information would be needed to proceed with any engineering work. Experiments with tethered satellites will provide useful data when they are successfully flown. Since the electrical effects of the Earth's magnetic field may prove to be a critical part of the station design, we may end up launching our own experiments if the rest of the world cannot supply the information we need in time. Although the FKE Space Program calls for construction of one LEO base to start, we will eventually expand our facilities to include several space stations in the same orbit at different points around the globe. Having redundant stations will increase our space system's capacity and reduce Earth-launch timing constraints. A taxi and bus system between the facilities will allow travelers in space to move from one location to another as needed, which should be both less expensive and less restrictive than requiring direct launches from the ground to a particular station. It will also relax navigational restraints on inbound flights, since vessels coming from Lunar orbit will have more targets to aim toward. As our constellation of space stations grows, we will have a unique opportunity to build a network for ground and space communications. Using phased antenna arrays attached to the station superstructure, we will be able to provide direct satellite broadcasts to specific users on the ground. Since we will have large satellites passing over the most populated areas of the globe on a regular basis, offering store-and-forward message service will require nothing more than building in the necessary transponders and memory systems. Once we have enough space stations built so each can see a neighbor ahead and behind, we will also be able to provide direct space-to-space routing of communications around the globe. In orbits 300 miles (490 km) above the Earth, a network of ten stations will have line-of-sight paths between neighbors that pass approximately 90 miles (147 km) above the surface, clear of most atmospheric distortions. Constructing so many LEO stations is not near-term priority, however, and FKE does not anticipate entering that market in the near future unless other compelling economic factors enter the picture. As soon as the required systems have been installed in orbit, we will begin transporting robotic construction equipment and supplies to Luna. Our program definition calls for minimal additional construction in low Earth orbit in the immediate future. Although there are a tremendous number opportunities for development close to Earth, our first objective is construction of facilities more removed from the local environment. To that end, we will leave the remaining near-Earth development possibilities open to other firms more interested in them for the time being. The next stage of development in the FKE Space Program will be to build a Lunar base. Its construction will be started by robotic and remotely operated equipment flown in for the effort, so that the first workers will have facilities they can depend on for survival for at least several months when they arrive. Once these minimally habitable facilities have been put in place, human crews will be sent in to finish the work. Our objective at this stage is to establish a manned Lunar base built as a permanent, nearly self-sufficient colony with a minimum of frills. Its primary purposes will be to manufacture the space construction equipment, to launch raw materials and equipment to the free-space construction site, and to provide temporary housing for travelers moving between other work sites. The most prominent feature of the base will be its linear launchers, catapults similar to the one built at Technopolis to provide FKE's spaceships with their first boost from the ground. The Lunar launchers will probably be nuclear powered to provide continuous operation, but we also have the option of using solar collectors during the long Lunar days to provide power for the motors. That would leave the base essentially shut down for two weeks at a time, until storage facilities could be constructed to supply the massive electrical requirements of the boosters. With no atmospheric drag to worry about, the launch rails will use very high acceleration rates for the buckets of raw materials being sent into space, with the loads leaving the ground already at their final velocity. The buckets will be decelerated at the end of the loop, and return to carry another load through the system: Only the cargo will be shipped into space. Sending people into space from the Moon will be more of a challenge, since the linear accelerators must be operated at lower rates to avoid crushing their human cargo. In addition, the launches will have to include spacecraft equipment to provide life support during their journey. Unless extremely long launch tracks are built, supplemental boosters will be required for human launches to get the desired final velocities. These rockets will be fueled by native Lunar materials, quite possibly using excess oxygen generated by the smelting operations as their propellant. 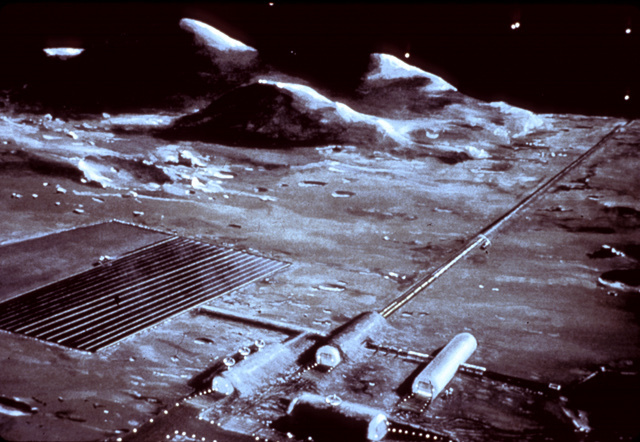 The initial Lunar base is going to be rather Spartan, not so much out of budget constraints, but since it isn't the preferred location for space colonization, because of the Lunar gravity well: It's harder to get from the Moon to other locations in space than to travel between two points already in space. In its favor, the Moon does offer a stable planetary base to work from, which reduces the amount of material required for meteor and radiation protection, and more immediately available resources for construction work than are found in open space. Between its reduced gravity and the fact it has practically no atmospheric drag on departing spacecraft, the Moon presents a more attractive location to start exploring other parts of the Solar system from than the Earth does. Once our base is established, the option exists to build it into a substantial scientific community. Over its life, the base will undoubtedly grow into a city with broad range of operations, but when we first get there, FKE will be using it primarily as a way point on a larger journey. Following development of the Lunar base, and its manufacturing and launch facilities, the majority of the effort expended in the FKE Space Program will take place in space, away from any planetary masses. The target location, known as L-5, is a gravitationally stable point in the Moon's orbit sixty degrees behind Luna as it orbits Earth (see What is L5? for further information). The advantages of this work site include the Sun is always visible (as a usable energy source), and that there isn't a tremendous gravity barrier to be overcome when moving to other points in space, as there is from a planetary surface. This latter point is going to become increasingly significant as we build massive structures (such as solar power satellites), then need to transport them to new locations. When traveling to L-5, the initial flights will be made from the Moon, since there is less of a gravity barrier to overcome. Personnel and much of the equipment used to construct a base in space will first be transported to Luna, which will be used as a staging area to coordinate the shipping effort. 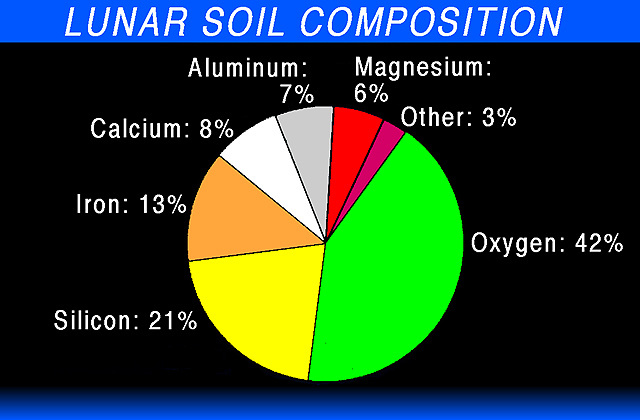 Most of the raw materials, however, and any equipment that can be manufactured there, will originate from the Moon. As the L-5 facilities are constructed and it becomes an easier navigation target, direct flights from Earth will become more common: It is just as far from the Earth to the Moon as it is from Luna to L-5, and significant savings of both fuel and time will be achieved by following the direct path. Upon arriving at L-5, we will first set up a rough work site from which to construct the other projects that are to be built there. 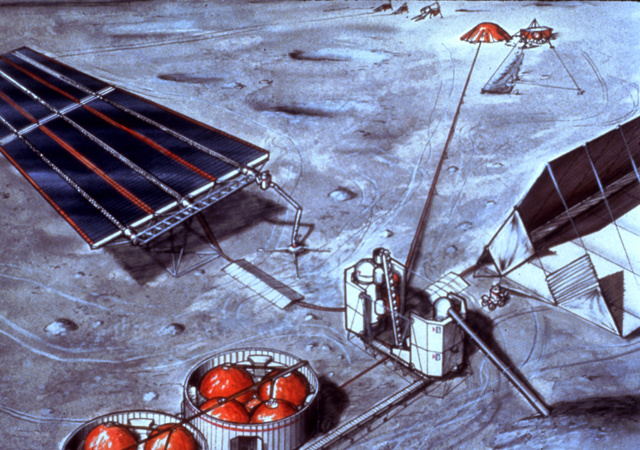 The "construction shack" will consist of a loose assemblage of relatively autonomous spacecraft, each dedicated to a specific purpose: furnaces for smelting lunar ore, automated manufacturing systems that turn out components ranging from electronic parts to massive keel beams, and the living facilities for the work crew, as a few examples. Most of the work at L-5 will be done under microgravity conditions. Since current medical research indicates gravity is necessary for continued health in human beings, however, establishment of an artificial gravity environment for the living facilities will be a high priority. With a massive shaft at its center to serve as an axle and anchor point, a network of cables will stretch out to form a rotating disc, with pressurized modules on its rim serving as the housing units. Workers will ride an elevator from their home to the core at the start of each shift, experiencing the sensation of a gradual decrease of the tug of gravity as they approach the "top" of the trip. Upon arriving at the hub of the housing unit, they may move to a transfer vehicle which then slows to remove their rotational velocity so they can leave the facility. An alternative design calls for a tube built as a series of rings, each rotating at a slightly slower speed. As the astronaut travels from one end of the shaft to the other, their speed relative to the environment would be reduced by gripping a hand-hold on each ring in turn. Either way, the reverse process would be used at the end of the day to return to their home, where the pull of gravity will help reduce the muscle atrophy and bone calcium losses found with long-duration space flights to date. The work crew at L-5 will be divided into two teams, each with their own major objective to work toward. One group's effort will be to manufacture the solar power plants that will generate the electricity to be sold to pay for the entire FKE Space Program. The other set of workers will be building full-fledged space colonies that will provide a more permanent home for the community established around the construction project. Since the solar power satellites will initially be a higher priority, they will get most of the resources shipped from the Earth and Moon at the start of the program. As revenues start to come in from the first commercial deliveries, however, we will be able to divert an increasing amount of our assets toward the colonization effort. 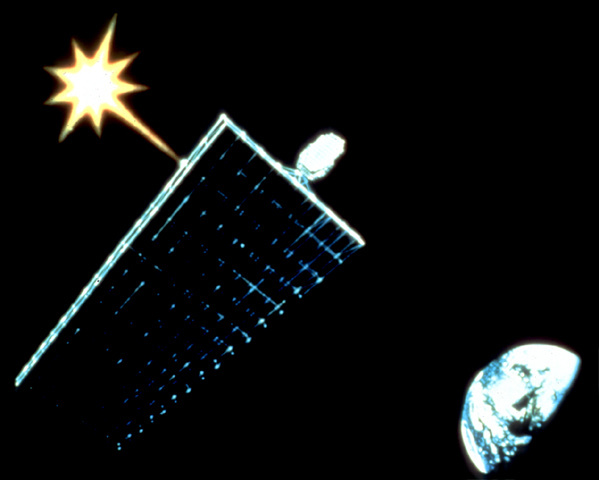 As was explained at the start of this chapter, the target of the FKE Space Program's initial efforts is to design, construct, install, and operate solar power satellites in orbit around the Earth. These structures, typically ten to fifteen miles across, will be "dropped" into geosynchronous orbit from their construction site at L-5, so that they appear motionless from the ground. From those positions, they will collect the abundant solar energy, convert it to microwaves, and beam it to the power-hungry civilizations of Earth. If this effort proceeds at a sufficiently high rate, we might be able to bring solar power on-line before the global economy is strangled by a lack of operating energy. Failure to do so would undoubtedly have dire consequences. The opposite end of the solar power circuit is the receivers on Earth built to convert the incoming beam to useful electricity. The receivers are actually antenna "farms" measuring miles across in each dimension. Since the antennas will intercept effectively all of the microwave energy from the power beam, yet still allow sunlight to reach the ground, food crops can be safely grown under antennas, making possible dual purpose use of land they consume. The microwave beam density will actually not be much more than that of natural sunlight. Its efficiency is due to the fact that its power is concentrated in narrow band of wavelengths, resulting in a much higher useful energy density than that found in sunlight. Because the microwave beams will not affected by cloud cover or the dark of night, the solar power satellites will offer continuous, consistent and reliable operation, something ground-based solar collectors could only dream of. On the surface, running a solar power satellite may seem like a simple job. However, there are considerations that could actually make it quite complex. For example, the force of the solar wind on the huge satellites will make their operation more like controlling a sailboat in gusty weather than running a generating station at a fixed facility: The captain of these vessels will have a substantial navigation job dealing with the vagaries of the solar weather while trying to keep the ship pointed toward a fixed location on the ground. System safety won't be the major concern, since the microwave beam power will be controlled by signals from the receivers on the ground: A drifting beam would be automatically cut off to avoid any potential danger caused by faulty targeting. The captain's concerns, however, will be to insure the health and safety of his or her crew, and to insure a continuous supply of energy to the electric system's customers. Most of the work to date has been toward using microwaves to transmit the power from the solar satellites to the ground. Ultraviolet lasers have also been researched, and may be used in the systems that are actually built. Since efficiency of the system is a major objective, any other methods of safely beaming energy that may be developed will be examined for their commercial potential. The effort is likely to continue long after the first satellites have been placed into service. In the end, the space program leading to the construction of solar power satellites will provide a vast array of benefits far beyond the steady supply of electricity that is its direct result. Advances in medicine and robotic technology needed to build the system, and the increased understanding of the dynamics of a healthy ecosystem necessary to build a self-sufficient space colony are just a few of the other things we can expect to gain from. By the time FKE is delivering solar power satellites into service, we will have a substantial space infrastructure in place, with the time on our hands to start seriously thinking about even wider horizons. After the space colonies are established and solar power satellites are beaming electricity to power Earth's economies, where does that leave FKE? For a vision of some of the longer-term goals the company has in mind, please see the essay on Future Directions in the Where Are We Going? section of this site.